Summer has always been about family vacations and long car rides. Mainly because when we were growing up our main summer vacation destination was Rochester, NY. Not the most glamorous of vacations, but it was fun. Mainly because that's where my cousins lived. We went there twice a year for basically our entire childhood. And now that we're grown, we've taken to visiting each other in our own homes. She has since moved to Atlanta while I'm still in NY and it's now a plane or a two day car ride away, but it's our kids who have grown to love it. So this summer is the first time they're coming to stay at our house. 4 young kids in a NYC house is going to be... loud. But it's family. So since my cousin aka SoupBelly was coming to visit, I needed to pull out all the food stops. So we decided on a menu way before we figured out what we were actually going to do while they were here! We decided to collaborate on a brunch. She wanted to make eggs benedict, so I figured I'll make the English muffins. 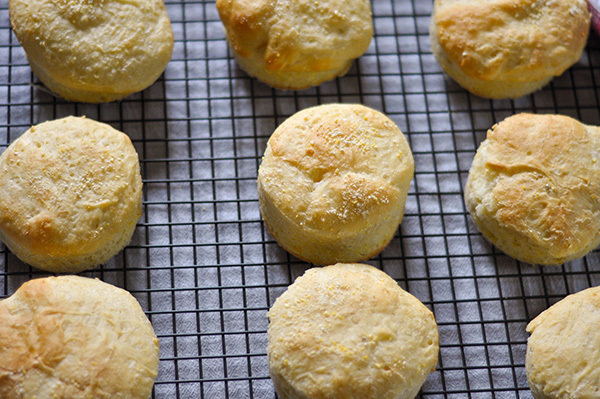 My favorite recipe for english muffins are from Model Bakery in Napa Valley. But since that takes 3 days to make, it wasn't really practical.... So I decided to go with a 2 day recipe for Sarabeth's English muffins. It's a whole day easier! These english muffins are the best in NYC, and aren't at all like the ones you find in the supermarket. They're baked, not pan fried and they rise extra tall. Pre Kids, Sarabeth's was our go to brunch spot in the city and no matter what I ordered, I always had to get their english muffins. They're something special, and you can't find them anywhere else. So I started the night before. While my husband and cousins were starting our three night tournament of Cards against humanity, complete with wine and charcuterie board, I was starting this dough. I warmed the milk, water, butter, sugar, and salt over a medium heat to melt the butter. Allow this to cool to room temperature, then added the yeast. This sat for 5 minutes to allow the yeast to get warm, bubbly and activated. I then added the flour and in a stand mixer, mixed till it was all combined. I shoved that baby into the fridge and let rise overnight. After our rousing game night, through which we repeatedly told our kids to "GO TO SLEEP!" We threw in the bowl and went to bed. Little did I know, that at 4:30AM, I would be awoken to the sounds of a 5 and 6 year old chatting it up and battling pokemon against each other. I managed to scrounge another 1 1/2 hours of sleep (after taking away their flashlights and pokemon watch) So at 7a, I got up to check on my dough. It rose beautifully in the fridge. I buttered the hell out of my english muffin rings. Yes I own these and I bought them years ago when I first discovered I can make these english muffins at home! So I buttered and dusted the rings in cornmeal. Then I stirred down the risen dough and scooped it out with a medium sized cookie scoop. About two scoops per ring. Then I let them proof for about an hour. Man, oh man, did they rise. A bit too much, but I baked them none the less. They came out kind of ugly, but a little trim around the edges and they were just as cute as they are in Sara Beth's bakery. I split them in half and toasted them on a griddle with some clarified butter. Then I let Soupbelly take over brunch. She made a savory one skillet home fried potato with peppers and onions. Making potatoes in one pan is way easier than I would expect. No par boiling, just a little water near the end of cooking and these potatoes came out so good. Though, I thought we made way more than we needed (5-6 yukon gold potatoes diced) but by the end of brunch, there wasn't a cube of potato left!. Poaching eggs is something of my white whale. I tried it before but have never gotten it quite right and was terrified to try again. Luckily, Soupbelly showed me that a splash of vinegar a good swirl of the water made for a beautifully poached egg. We then tirelessly took turns beating together a hollandaise sauce (bat wings be damned!). It turned out smooth and creamy, and it too wasn't as scary as it sounds! Together with 4 hours of sleep combined, we conquered some of our biggest brunch fears. This fully scratched made Eggs Benedict brunch was a true hit. 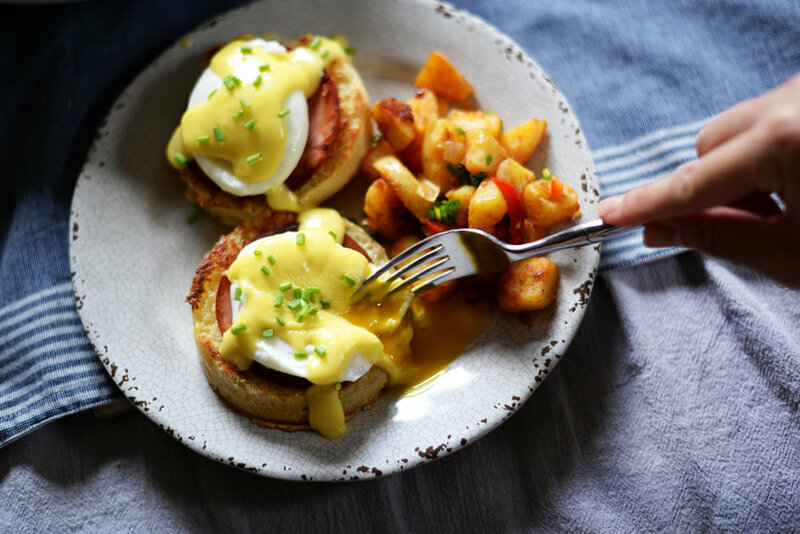 Warm buttery fresh english muffins, sitting under griddle canadian bacon, a perfectly poached egg drizzled with a silky warm hollandaise sauce. It doesn't get any better than that. Conquer poached eggs and hollandaise with this full brunch recipe on Soupbelly's blog! 1. At least four hours, and up to eight hours, before making the muffins, prepare the batter. In a medium saucepan, bring the milk, water, butter, sugar, and salt to a simmer over medium heat, stirring often to dissolve the butter. Transfer to the bowl of a heavy-duty stand mixer and cool to room temperature. 2. 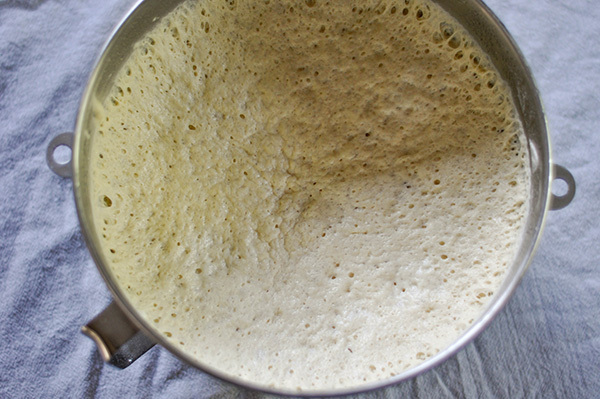 Sprinkle the compressed yeast into the mixer bowl and let stand for 5 minutes, then stir to dissolve. (Or, if using dry yeast, in a small bowl, sprinkle the yeast over ¼ cup lukewarm, 105° to 115° F, water. Let stand until the yeast softens, about five minutes. Then stir to dissolve. Pour into the mixer bowl.) Stir the egg into the yeast mixture. Attach the bowl to the mixer and fit the mixer with the paddle attachment. 3. In the bowl of an electric mixer gradually mix the flour into the yeast mixture to make a sticky batter. Increase the speed to high and beat for 30 seconds. Remove the bowl from the mixer and scrap down the sides of the bowl with a silicone spatula. Cover the bowl tightly with plastic wrap and refrigerate for at least 4 hours, or up to 8 hours. 4. Butter the insides of 12 metal entremet rings (3 inches in diameter and 1 ½ inches tall). Place the cornmeal in a small bowl and coat the insides of the rings with some of it. Reserve the remaining cornmeal. Line a half-sheet pan with parchment paper. Arrange the rings on the parchment, spacing them about 1-½ inches apart. 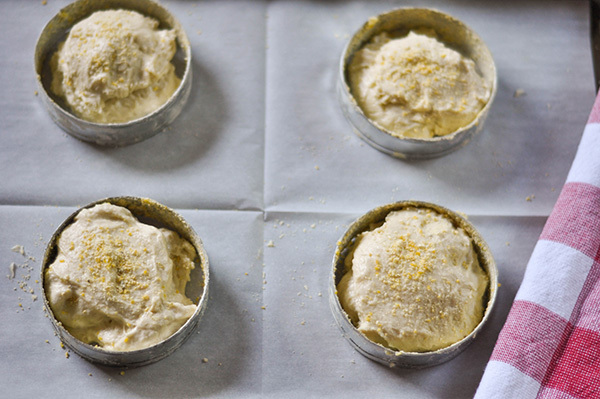 Sprinkle a light, even coating of cornmeal into each ring (approximately ¼ teaspoon per ring). 5. Stir down the chilled batter, it will be very sticky. Using a 2 ½-inch diameter ice-cream scoop dipped in cold water, scoop a level portion of dough into each ring. Lightly sprinkle the tops with the remaining cornmeal. 8. 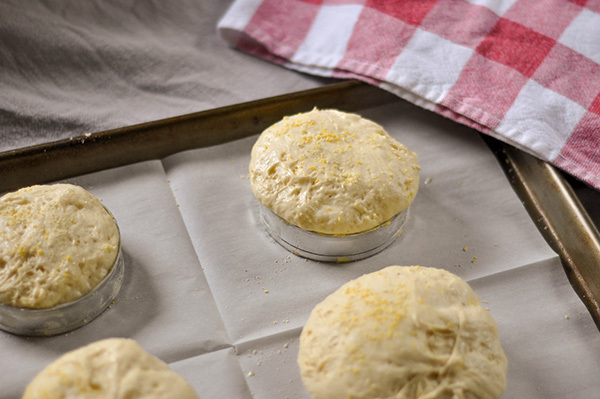 Carefully remove the plastic wrap and bake the English muffins until the tops are golden brown, about 25 minutes. Let stand for five minutes, and then remove the muffin from the rings, protecting your hands with a kitchen towel. Don't leave the rings on for too long, otherwise the muffin's will looked cinched at the waist! Split and toast before serving.